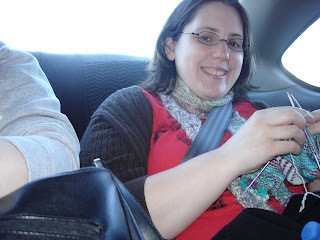 Knitting Like Crazy: A trip to Milwaukee. . . .
A trip to Milwaukee. . . . This is my favorite picture I took while up in Milwaukee--it's an orchid. What kind? That I don't know. I just like to look at the flowers. As soon as I look at the name of the flower I immediately forget it. What can I say...it's a curse! Finally, here is the picture of the outside of The Domes. It was built in the 1960's. Clearly, you can tell that just from the picture. Anyway, after sock knitting and flower sniffing and stuffing adults into a tiny car, I would have to say it was a good day! My new sock project is some Jaywalkers with STR in the Lucy colorway. I just started them, but they are looking good so far. My sweater is coming along nicely. I would have a picture, but it's just more ribbing than the last picture....nothing too exciting!